A half-time ticking off from Martin Canning inspired Hamilton Academical's players to come from behind to win at Rugby Park. Canning felt his side deserved the 2-1 victory, having fallen behind to a Greg Kiltie goal, but only after they raised their game in the second half. "I told them it wasn't good enough for the standards they've set themselves," he said of his half-time team talk. "That they weren't doing themselves justice and they could do more work." Canning continued: "First half, we weren't at it as much as we have been for most of this season, so I was pretty disappointed. "Every ball that dropped, they wanted it more than us which was disappointing because that's the first time this season I can say that. "Second half, I said go out, be brave, just enjoy the game and relax and play. We had to control the ball better. "The character and response was different class and once we got ahead then we deserved to win. It was pleasing to close the game out." 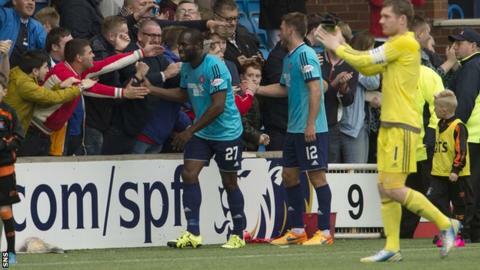 Canning praised the goal-scoring and contributions of Dougie Imrie and Ali Crawford, as well as the other established, experienced players in his side. Ziggy Gordon, the long-standing full-back, saw a late header cleared off the line, while Christian Nade was bright in a cameo as a substitute. Canning believes that the depth of his squad means that Hamilton can be consistently strong throughout the campaign. "It's a strong squad, there are some boys who will be disappointed they're not playing but over the course of the season they'll all be needed," he said. "It will be valuable for us to have such depth in the squad." The Kilmarnock manager Gary Locke felt his side did enough in general play to do more than lose the game. He bemoaned the failure to convert chances as well as some poor defending for costing his side the points. "I thought we were the better team for the majority of the game and one of the things that disappointed me was that we didn't take our chances," Locke said. "We created a lot but we've got to be more ruthless in front of goal. And the goals we lost, the first one especially, we have to do better. "You can't just let he boy get the ball in the middle of the pitch and turn. To be fair to Dougie, it's a fantastic strike, but it's a slack goal from our point of view. "I was really happy with the way that we played, but we've got to be more ruthless in front of goal. Because we missed he chances, at 1-0 anything can happen and Hamilton started he second half that little bit brighter than we did."